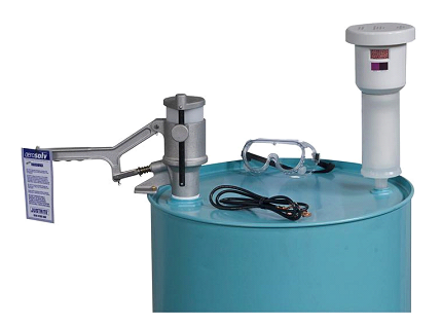 The Aerosolv Aerosol Can Disposal System punctures and relieves pressure of spent aerosol cans, changing them from solid hazardous waste to a non-hazardous state. Punctured, discharged, cans do not meet the definition of hazardous waste as per EPA 40 CFR 261.23(a)(6), and thus can be treated as recyclable scrap metal. Simply place an aerosol can into the unit; lock the lid to secure can in place and then push down on the lever. The durable, non-sparking piercing pin punctures the can, and the residual liquids flow directly into the collection drum. Residual propellants are filtered of VOCs by the two-part combination filter that threads directly to the 3/4″ bung. The base coalescing cartridge transforms residual liquids into droplets that collect in the reservoir of the coalescing cartridge, allowing for easy drainage, directly into the drum if desired. The activated carbon filter cartridge signals saturation and serves as a replacement reminder. Safely handles pressurized cans for secure and controlled disposal processing. Made of low maintenance aircraft aluminium and threads into standard 2″ bung on 30-gallon (110L) and 55-gallon (200L) drums.